A welcome rewarding gift for any occasion. Eight certified organic and kosher Eden food items arranged in an organic cotton canvas tote - 100% whole grain Kamut & Quinoa Twisted Pair; 100% whole grain Kamut Spaghetti; Vegetable Spirals with colors from organic vegetable powders; award winning cold pressed Extra Virgin Olive Oil; Spaghetti Sauce; Pizza-Pasta Sauce; Crushed Tomatoes; and Cannellini white kidney beans. Create stir fries, pasta dishes, minestrone, sauces, pizza, and salads with wholesome ingredients. Dozens of easy and satisfying recipes included in the 40 page Recipe Book with color recipe photos. The double hand stitched, 18" x 14" gusseted, organic cotton, canvas tote is machine washable. 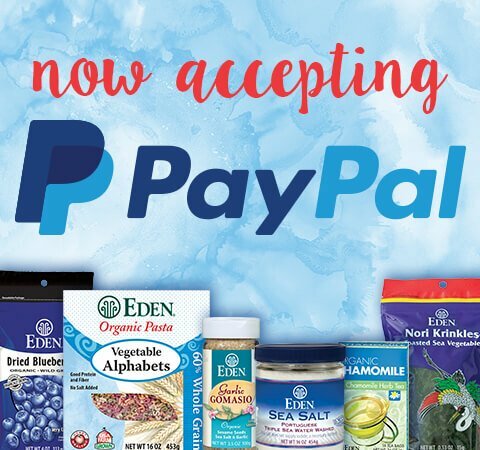 A welcome and rewarding pure food gift for a holiday, wedding, housewarming, anniversary, birthday, etc. 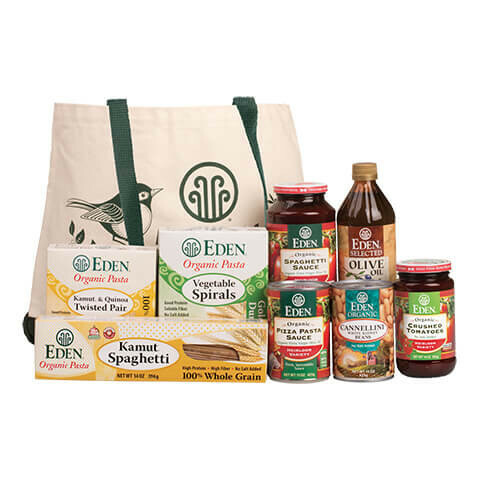 Eight Eden organic foods nicely arranged in a durable, 100% organic cotton canvas tote. Eden Kamut & Quinoa Twisted Pair -Gemelli pasta - 70% high plains kamut and 30% Andean Quinoa. Eden Kamut Spaghetti - High plains organic Khorasan (Kamut) wheat, an ancient variety. High protein, sweet flavor, and very satisfying, smooth taste. Eden Vegetable Spirals - organic vegetable powders provide the colors - gold, red, orange, and green. 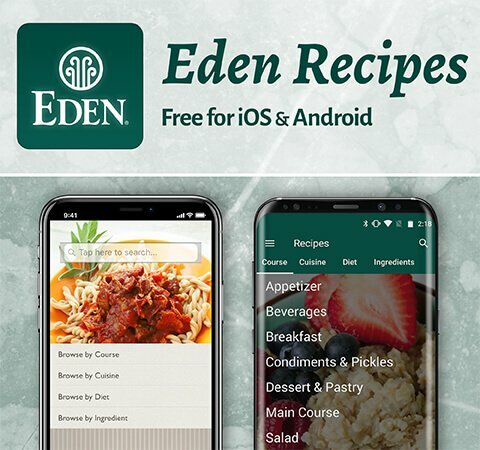 Eden Spaghetti Sauce - Organic Italian Roma and Napoli heirloom tomatoes, organic extra virgin olive oil, and sea salt with all organic traditional herbs and spices. Eden organic Pizza Pasta Sauce - A thick, delicious pizza pasta sauce made from hand harvested, organic Roma and Napoli tomatoes cooked with a bit of organic extra virgin olive oil and sea salt with all organic herbs and spices. Eden Crushed Tomatoes - Amber glass jarred with no salt added. Extra Virgin Olive Oil - Spanish olive oil smoothness in protective amber glass. The epitome of healthy oil. Eden Cannellini or White Kidney Beans in BPA, BPS, and phthalate free cans. The sturdy 18" x 14" tote bag with a 4" gusset and 25" sturdy woven handles of certified organic, unbleached cotton canvas. U.S.A. handmade, double stitched strength. This large tote compliments our medium and small canvas totes. The tote is handy for shopping, errands, beach, work, carrying books, arts and crafts, etc. Machine washable with cold water. Hang to dry. 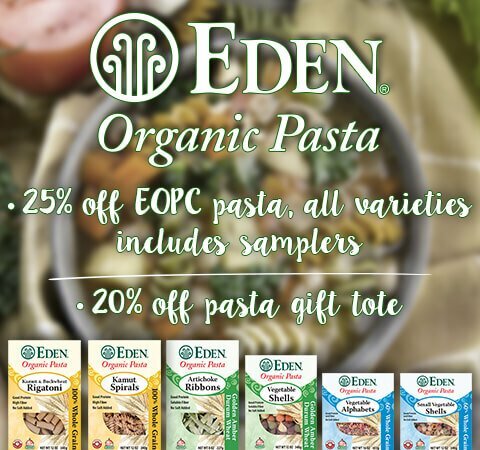 The flavor and character of the grain is evident in organic Eden Pasta. Traditionally made on vintage Italian equipment; thorough kneading, artisan brass dies, and slow drying create pasta of exceptional flavor and texture. All are made with no salt added. Heirloom Roma and Napoli tomaotes, 5th generation family farm organically grown for exceptional richness. Hand cultivated and hand harvested, cooked almost immediately to capture the most value. Share dozens of pleasing dishes from the recipes in the 40 page Recipe Book with color photographs. Over 1,160 free recipes in the recipe section of this website.